With the upcoming holidays like St. Nicholas Day, Hanukkah, Christmas, and New Year, there will be lots of parties to attend, and lots of party foods to prepare and sample. I will contribute by posting some of my favorite recipes for these occasions. At our latest family gathering at Thanksgiving, I prepared this fairly light caramel dip, and it was my daughter-in-law’s favorite dip. I was so delighted, and decided to post it here for you to try and to enjoy. It requires very few ingredients, and it is much lighter in flavor and texture, than the store bought caramel dip. This recipe yields 2 cups of dip. In a medium bowl, combine cream cheese, honey, caramel topping, and 1 1/2 tsp. of cinnamon. Transfer into a serving bowl, sprinkle with ½ tsp. of cinnamon. 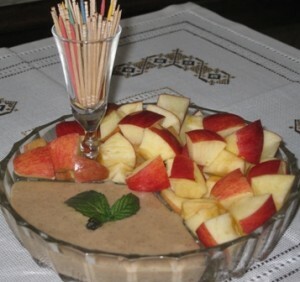 Place the bowl of dip on a platter, and arrange apple pieces around it. If you like cinnamon you will like this dip. I forgot to mention that I also added a pinch of ground cloves, to complement the cinnamon flavor. This sounds really easy and looks great. I just bought a really big bag of Apples from Sams Club too! How are your plans for the holidays going? I love apples this time of the year, and it sounds like you do too. I use apples for baking, making fresh apple sauce, mix them into my pancake batter, bake them whole with brown sugar…..
“Apple A Day Keeps The Doctor Away”……there might be some truth to that, after all. You mix them into pancake batter…mmm! Do you just throw in little pieces of apples while you’re mixing the batter? I cut up apples to small pieces, sort of dicing them, mix a little bit of cinnamon in, and then fold them into the pancake batter. I use a large serving spoon to scoop the batter with apples to place it on a hot pan for frying. My family really likes these pancakes.